Mayor White was born in Council, Idaho and was raised in Idaho. His early years were spent in Cascade, Garden Valley, and New Meadows, Idaho, where his father was a timber faller for the JI Morgan Logging Company. Summers were spent at Warm Lake, and Deadwood, Idaho. The family settled back in his father’s home town of Fruitland, Idaho, where Monty went to school from 1st grade to graduation from Fruitland High School. Monty joined the US Forest Service in Mountain Home, Idaho, fighting fires around Idaho and most of the western states. He continued his education during the winter months at Treasure Valley Community College. In 1977, Monty was promoted to Assistant Fire Management Officer for the Mountain Home Ranger District Boise National Forest. Along with his AFMO duties Monty attended the Federal Law Enforcement Training Center in 1984, graduating from the Academy in December of 1984. In 1988, Monty graduated from Criminal Investigator Training at the Federal Law Enforcement Training Center Glynco, Ga. Monty then served as the District Law Enforcement Officer as well as the AFMO until he transferred to the Bureau of Land Management as a Law Enforcement Ranger. Monty and his wife Sammy moved with their children to Glenns Ferry in the summer of 1992. Monty finished his federal career as the Staff Ranger for Idaho BLM and retired to Glenns Ferry in November, 2004. Monty and his wife Sammy have loved the area since moving here in 1992. Monty and his wife Sammy have two grown children and four grandchildren. Monty has served on the local School Board, Fair Board, E911 Board, and has been active in FFA and 4H with many of the local youth, and his family. Mayor White is an avid fisherman. He is not picky on what form of fishing as long as the fish bite. He does prefer to steelhead fish from a drift boat near Riggins, Idaho, but will fish with whatever they are biting on. 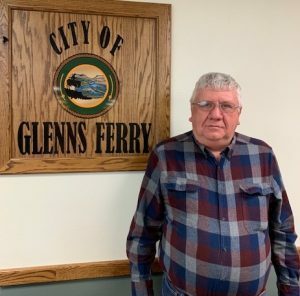 Mayor White has said that the community of Glenns Ferry is a great place to raise a family and he is proud to serve the people of Glenns Ferry as their Mayor. Mayor White can be reached at [email protected] phone 208-366-7418 or cell phone 208-598-3080. Mayor White tries to hold office hours from 8 am to 5 pm Monday thru Thursday and on Fridays from 8 am to noon. Mayor White is available by appointment after hours. Call the City Hall to arrange a meeting.